ABOUT THE AUTHORS - BEYOND A WHISPER, BEYOND A DOUBT – ANIMAL COMMUNICATION with Cathy Seabrook D.V.M. Dante and I, after a swim at Providence Bay, in Lake Huron, 2009. None of this work would exist without the animals, and I hold them entirely responsible for the creations of our websites and books! Ideas, questions and answers spring from the Collective Consciousness of PETS, PONIES and HORSES. What does this phrase mean? The Collective Consciousness represents the present leading edge state of being, with all thoughts, knowledge and opinions gleaned from living life in the fullness of experience in the world. It represents a consensus of opinion and beliefs held by the evolved status of the individual animal groups. And taking dictation from such a group represents quite a challenge, as they all wish to speak at once, and at a rapid speed. It is very different communicating with individuals, who don’t compete for their own space to speak! so first of all, I acknowledge the brilliant contribution and dedication of the authors called Pets, Ponies and Horses. As for me, I was born and raised on Manitoulin Island in Ontario, Canada. Manitoulin Island is known as the largest fresh water island in the world, and it is an island steeped in spirituality, named after Gitchie Manitou, the Great Spirit of the Native people. It was the perfect place to be a child in love with animals! My story begins the first night home from the hospital, with my parents worried how the little family dog Mickey would react to me, as she had been the only child! She had a habit of finding one of my dad’s socks to sleep with, and when my parents looked over at Mickey my first night home, she had found a little bootie for her sleep time comfort. That settled everyone’s mind about baby and doggie. At the age of two, my mother lost track of me in a barn where my dad was negotiating for a tractor, and discovered me under a large work horse, standing quietly as I reached up to touch him on his belly. At the age of seven my dad went to see about a pony for me, and said to my mother he had good news and bad news for her. The good news was he had found a pony and the bad news was he came with two more! So life was full of animals with countless kitties, several precious dogs, and as much as ten horses and ponies at a time for me to play with! And from the time I knew what a veterinarian was, I wanted to be one! But when it came time to choose courses for the final year of high school, veterinary medicine seemed unattainable, requiring three maths and three sciences in Grade 13, and I abandoned my idea and concentrated on Fine Art and English. I received a scholarship in Fine Art from the University of Guelph, and attended there for a year. It was not to my liking, and I spent all my spare time volunteering at the Veterinary College. I returned home disillusioned after first year University, lacking direction for my next step. But the animals knew exactly what to do to propel me down my designated path, and my beloved pony Ginger fell ill to an undiagnosed disease and died. 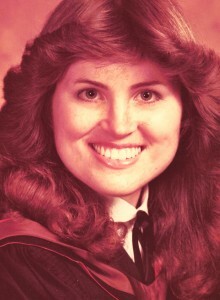 I never wanted to feel that helpless again, and in spite of lacking the required prerequisites, I enrolled in the Agricultural Sciences Program at the University of Guelph, used all my English and art credits as electives, and was accepted the following year into the Ontario Veterinary College. I graduated from the Ontario Veterinary College with Honours in 1981. I practised Equine and Small Animal medicine as an associate veterinarian in various practices for 12 years, and in 1993 I opened my own practice, The Island Animal Hospital, in my hometown of Mindemoya on Manitoulin Island. As sole practitioner in a busy practice, on-call 24/7, life delivered to me the full embrace of veterinary practice for another 18 years. In the year 2005, I had my first experience in animal communication, which I had certainly heard and wondered about, but not endorsed as reality. And though veterinarians wish we could hear animal’s thoughts, few actually believe in the reality of such an unscientific process. Only dire straits convince veterinarians so grounded in traditional veterinary medicine to explore something as fantastically unbelievable as animal communication. As chance would have it, I was surrounded by my teaching horses, many of them rescues, and one in particular had stolen my heart. 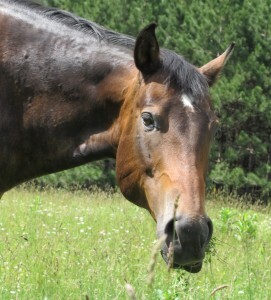 Dante was a rescue horse who came with powerful teachings regarding general life and Horsedom, and he had small airway disease, similar to asthma in humans, triggered by an allergy to dust, molds, and certain weeds in hay. In addition he had pneumonia when I found him which further damaged his respiratory system causing chronic coughing, and he had no stamina or capacity for training or riding. For five years I tried every medical cure known to veterinary medicine, various experimental cures, and recommendations from the Ontario Veterinary College. Nothing brought him relief. He was in serious trouble, and of course for good reason. While attending a training clinic in 2005, I met a practical, grounded, sensible woman who happened to tell me of an unintentional experience with a psychic healer, where her back was healed in an unconventional way! So when she had trouble with her horse, she thought nothing would be lost if she dared to try animal communication too, and got astonishing results. At this point I was ready to try anything to help my beloved horse, and I asked her without hesitation – do you think they know what medicine they need? And thus began my adventure into animal communication by reading textbooks, watching DVDs, listening to CDs, and anything related to educate myself and establish a basis of expectation to formulate questions to Dante. Finally, after weeks of deciding on the proper questions, knowing this one chance would prove or disprove the entire theory for me, I sent my ten questions to the same animal communicator the woman had used in Connecticut, and told Dante in the pasture that someone was coming to talk to him on the airwaves. He paid no attention, so I told him twice and then waited. It seemed like forever but at last the letter arrived with the answers to the questions. I was more excited about this letter than I was when I heard I had been accepted into Veterinary College! And it was awe inspiring. The communicator described Dante perfectly with his explosive, unpredictable, dangerous emotions and recorded meticulously his delightful and insightful ideas on treatment and training. The definitive verdict was delivered in the results of a body scan that was included in the process (I had to ask her what that was! ), and within that the communicator had noticed his right shoulder was higher than his left and that his right molars needed balancing. The body scan turned out to be correct, as he had a club foot due to injury before I found him, and the state of his molars were verified by the equine dentist shortly afterwards when she found extensive abnormalities demonstrated as wave mouth, cheek ulcers and slanted incisors, all on the right side of his mouth. When the anatomical and medical evidence matched the body scan I could not deny there was something legitimate about animal communication. As much as I knew about animals after 24 years of veterinary practice, my whole perception of them had changed in one letter, from my horse! Now how to learn it?! It was impossible at first. I tried every book and program I could find, and practiced day in and day out, but I could not hear them. I began to understand their wishes more clearly, and due to my new perception changed how I practiced vet medicine by openly informing all patients of the proceedings within their clinical experience, including asking for compliance and forgiveness, and my staff noticed the change in patient cooperation and also began explaining to the animals what was needed for ease in their clinical experience. 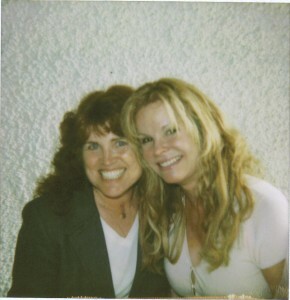 Amelia Kincade and me in Windermere, England, 2009. The beginning of words… such FUN! But try as I might no words came clearly to me yet! So when a course was offered in England with Amelia Kincade, a famous Animal Communicator and Author, I signed up to be taught in person and participated in a class of over 80 students. Animal Communication is very popular and embraced in England! And there I discovered I was somehow getting their messages because my answers were right at the end of the class! Communication had begun, but I needed more, and discovered a formal teaching program called Animal Spirit Network in Illinois which ran a 5 level program, and I enrolled and completed that in 2 ½ years. It served to awaken animal communication skills powerfully for me, and hearing roared to the forefront along with other abilities I did not know existed within the experience, or life itself! I sold my practice in April 2011 to devote my time completely to Animal Communication. I thought I would be doing basic question and answer sessions, but the animals had other ideas. The first notice I had regarding writing came from Dante, who told me he had a children’s story for us. He asked me to illustrate it as I understood the fullness of his story, and together we created Heart Hole Piece Named Horse, published by Balboa Publishing, a Division of Hay House. Dante even chose the publisher! Then PETS wanted their people to have relief for the grief when they depart, and our second book was born, Survive Saying Goodbye to Your Pet. Puppies, Kitties and Ponies had many things to say as well, and each dictated to me their books entitled Puppy Stuff by Puppies, Kitty Stuff by Kitties and Pony Stuff by Ponies. They love their titles! Then HORSE wanted to explain the energy dance in training, and we wrote Train Your Horses by Horses, an instruction book on training horses in simple and complicated movements, dedicated to the Collective Consciousness they call RIDER. Dogs wrote a training commentary book called Train Your Dogs by Dogs, offering their view of themselves in life and training, and giving advice on how to accept or change behaviors we have concerns about. Dogs have waited to “speak up”, and this book will enchant you into the feel of being a dog and knowing their viewpoint clearly. Our latest works are The Spiritual Nature of Horse Explained by Horse, The Spiritual Nature of Horse Training Explained by Horse, and Heart Notes for Healers: Disease Energetic Language Mastery. 1. This site, www.drcathyseabrook.com our Animal Communication with Cathy Seabrook D.V.M. main site where consultations may be purchased for your own animals, in written or live coaching formats. 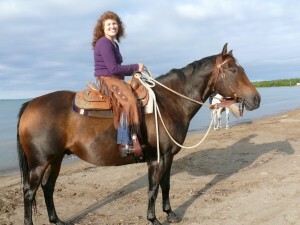 2. www.whatsupvet.com our ALL THAT IS HORSE site with my horses answers to questions about horse emotion/biology/mind, families and performance, and HORSEBLOG with stories using animal communication to train horses. 3. www.whatsuppet.com our DOG and CAT site with answers to many types of questions, and PETBLOG with stories about animal communication. 4. www.survivesayinggoodbyetoyourpet.com our Pet Loss site full of encouragement and helpful understanding as you approach or endure goodbye of the physical part of your beloved pet, and BYEFORNOWBLOG with stories to help people about pets departing.